3D printers have long since made it easy for anyone to make 3-dimensional zoetropes but did you know you can take advantage of a 4th dimension by stretching time? Previously the duration of a zoetrope animation would be however long it took for the platform to rotate once. To make it more interesting to watch for longer, you filled out the scene by creating concentric rings of animations. [Kevin Holmes], [Charlie Round-Turner], and [Johnathan Scoon] have instead come up with a way to make their animations last for multiple rotations, longer than three in one example. 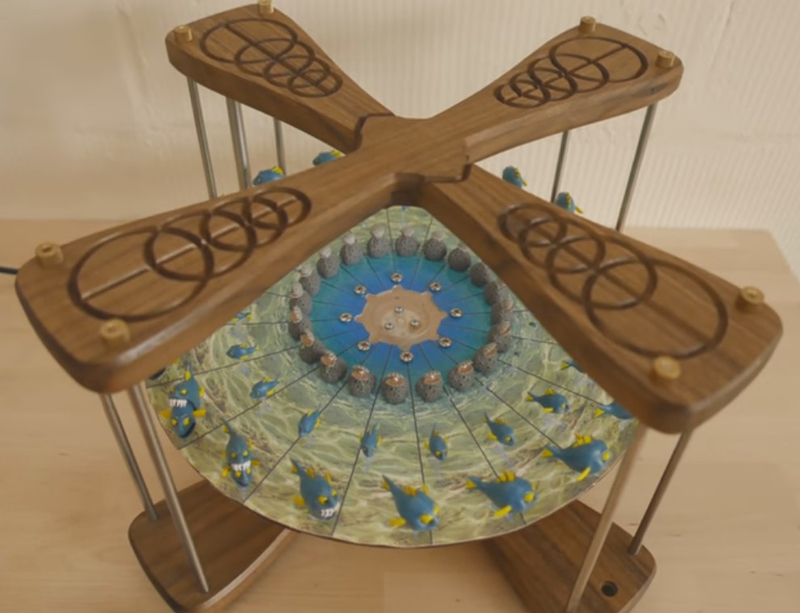 If you’re not at all familiar with these 3D zoetropes, you might want to check out this simpler version first. Their project name is 4-Mation but they call the time-stretching technique, animation multiplexing. One way to implement it is to use one long spiral beginning in the center and ending on the platform’s periphery. It’s the spiral path which make the animation last longer. In their Fish eating Fish animation, the spiral is of a small fish which exits a clam at the center and gets progressively larger as it spirals outward until it swallows another fish located in a ring at the periphery. Of course when you look at it with a properly timed strobe light, there is no spiral. Instead, it appears as though a bunch of fish move more-or-less radially out from the center. The second video embedded below walks through the animation step-by-step, making it easier to follow the intricacies of what’s going on. Other features include built-in strobe lighting and both manual and phone app control. This project is a product for a kickstarter campaign and so normally, details of the electronics would be absent. But clearly [Kevin] is familiar with Hackaday and sent in some additional info which you can find below, along with the videos. The control board uses an ESP8266 running an Arduino core with a WebSockets API to communicate between the ESP8266 and the app. Specifically they’re using Markus Sattler’s arduinoWebSockets API on the ESP8266 and Takahiko Kawasaki’s nv-websocket-client on Android. They’re not sure if these are the best APIs to use so if you have an opinion, please leave a comment below. For the strobe lights they’re using nine watt RGB LEDs with proper 45 mil chips (measured) for each channel. They’re slightly overvolting them with 24 V through 6 LEDs on each channel. With a full duty cycle they’d burn them out but they’re using a duty cycle of only around 1.5%. That’s because they found that for the animation to be sharp, the LEDs need to be on for about 0.5 milliseconds. The worm gear’s maximum speed is 100 RPM and they use a 2860-count/revolution encoder. For power they have DC power switching supply circuits which divide the 24 V down to 12 V for the motor and 3.3 V for the ESP8266. Four “giant” 680 μF, 35 V Panasonic capacitors buffer the current between each strobe. But the animation is the novel thing here and they’ve made their 3D models available on Thingiverse. They haven’t included the platform but that wouldn’t be too hard to replicate. For the fish animation, they suggest using a resin printer but we think that with support material and maybe a few tweaks, it should be printable with a filament printer. Or better yet, come up with your own animations! Zoetropes can be used for more than just fun and education. They’re works of art. Check out this one which squashes four dimensions into three and this one of a man walking on the outer rim of a rotating wheel. For those who like Zoetropes, there is a massive one in the Ghibli museum in Tokyo. Multiple levels and a lot going on in the small-car sized cabinet. The Ghibli museum is a must see for animation fans, well worth the visit while in Tokyo. Just be sure to reserve tickets a few months in advance…. I think there is a problem with conservation of mass and energy. Reminds me of “The Garden of Unearthly Delights” by Mat Collishaw. These things must look spectacular IRL. I’ve seen the spiral before in flat animations. I wonder if using an LED spotlight that slides out (maybe have it rotating on a flat plain) with the spiral would enhance the effect by only showing one evolution of the character. You’re not at all wrong, and nor are we claiming that : “telling multiple parts of the story simultaneously with repeating subjects on the same animation path in a loop, to make for a 3 second story inside a 1 second loop” – is new to the world of animation, but where have you seen it before in a 3D zoetrope? (excepting John Edmarks geometric patterns) or for that matter, where have you seen the technique described and summed up in a two word phrase? to whit: “Animation Multiplexing”. “Time stretching” is not a phrase we use, but your concise explanation doesn’t fit in a headline, and “animation multiplexing” is nonsense without context – you might argue it’s just plain nonsense – and maybe you’d be right, but then the question remains – how do you name the technique – how do you point out that the animations are longer than other zoetropes? I think the headline is good. Finally – it’s clear that you get it – but have you tried explaining it to anyone? What does this mean? What is a five mil chip? Do you mean 5 mm, or .005″? Please don’t use the ambiguous unit of measure “mil”. But even beyond that, what are “proper” chips, and what is being measured? oh that’s a typo – it should say 45mil – it’s the width in thousands of an inch of the LED silicone chip. The author didn’t quote my source text properly. I agree mil is a terrible unit (just look at the Mars Climate Orbiter) we should all be metric, but in the chinese LED world everyone seems to use mil. Fixed. Thanks. I blame my ancient eyes.